This is the sixth post in my series on the handling of domestic violence cases in Peoria, Illinois. My last post discussed whether one should plead guilty to domestic violence. It is very important for one to consult with an attorney before making such a decision. 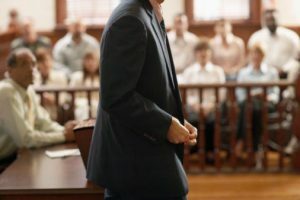 In this article I will address another important topic – what to expect when taking a case to trial. The final stage of a case is a complicated process and you should have an experienced criminal defense lawyer assisting you. Trial will begin with the selection of a jury. A pool of potential jurors will be required to appear in Court. Both the prosecutor and the defense attorney will be able to ask questions of the potential jurors to determine whether they can be fair, impartial, and whether they have any biases which should disqualify them from service. The Judge will also ask questions of the candidates. If a candidate has a clear bias then the Judge can remove them from the pool “for cause.” Each attorney will also be given a number of challenges to use for the removal of those whom they feel would not be fair. Challenges may not be used to remove a juror for reasons involving race, gender, religion, etc. Once a final jury has been selected then the jurors will be empaneled. The next step in the process will be for each attorney to give an opening statement. The prosecution will go first because they have the burden of proof and the defense will go second. Opening statements may not be used to argue that the other side is wrong. They are a time when the lawyers are to tell the jurors what the case is about and what evidence they can expect to be presented. The prosecution will present its case first. They will call the victim, the arresting officers, and any other witnesses they deem necessary. Your lawyer will be able to cross-examine these witnesses and challenge their testimony. The defense will then present its case. The defendant is not required to testify but may need to do so in order to establish issues such as self-defense. After the defense has rested then the prosecution will have an opportunity to perform “rebuttal” of any claims made by the defense. This is not a time to present new evidence; only issues raised by the defense may be addressed on rebuttal. It will then be time for closing arguments to jury. Trial in a Peoria domestic violence case can be very complicated process. You need an experienced attorney assisting you. I am a former prosecutor with extensive experience in our local court system. I have handled many such matters and am ready to assist you. Contact my office today to schedule a consultation. I also service the cities of Bloomington, Eureka, Galesburg, Morton, Normal, Pekin, Springfield, and Washington. I handle cases in the counties of Fulton, Knox, LaSalle, Marshall, Mason, McLean, Putnam, Rock Island, Schuyler, Stark, Tazewell, and Woodford. I also handle federal cases in Urbana.